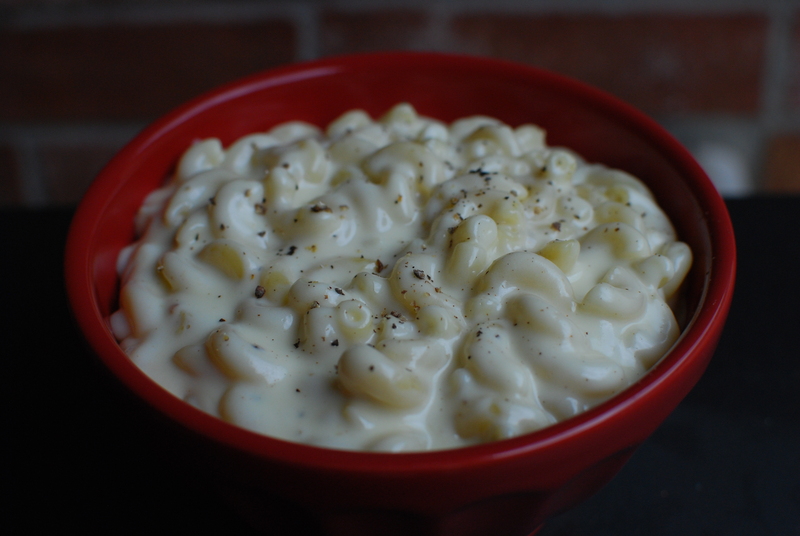 This macaroni and cheese and so THICK and CREAMY. It really is delicious. I just wish Ethan would eat macaroni and cheese, because if he did, we would definitely make this more. Did I mention that it’s THICK and CREAMY? And delicious? Goes great with barbecue, burgers, sandwiches, and just about everything. I’m generally not a fan of leftover macaroni and cheese. It can be hard, grainy, and the taste just off. But this recipe heats up beautifully! If you have leftovers, simply put the leftovers in a pot, add about 1/2 c. milk, and heat over low heat on the stove. You will never know that it’s leftovers! Seriously. In a large pot on medium high heat, add butter until melted. Whisk in the flour and cook for about one minute. Reduce heat to medium and add milk, half and half, salt, dry mustard and pepper. Continue whisking until it begins to bubble. Reduce to low and add white cheddar. Stir until melted. Add cooked pasta, stirring until combined. Remove from heat and allow to sit about 5 minutes to thicken. Season with additional salt and pepper if desired. ENJOY. If you have leftovers, when you want to reheat it, add about 1/2 c. milk and cook it on low on the stove top. Worked perfectly.